Intended as a 'travel guide' to the world of management, the content contains reliable maps of the terrain, critical viewpoints, with ways forward outlined, and an exploration of the nooks, crannies and byways whilst still observing the main thoroughfares. This is a resource that will help navigate this world, encouraging the reader to explore not only the new, exciting and brilliant aspects, but also some dark sides as well. A new chapter on "Organizational Conflict" Revised case studies examining key organizational issues and exploring diverse scenarios. Even more examples and cases throughout covering the most current examples from the business world - e.g. Airbnb, Uber, Spotify. A free interactive eBook* featuring author videos, web-links to news articles and Ted Talks, multiple choice questions, flashcards, SAGE journal articles and other relevant links, allowing access on the go and encouraging learning and retention whatever the reading or learning style. 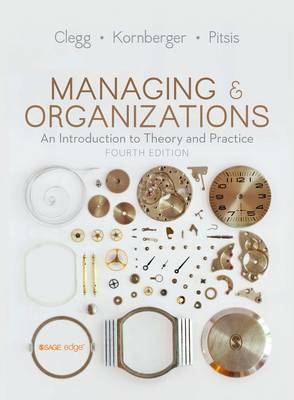 Suitable for students studying Organisational Behaviour, Managing People in Organisations and Introductory Management courses taking an Organisational Behaviour slant.